The Perky-Pet Super Carousel Wild Bird Feeder is part of a full line of bird feeder products from Perky-Pet. Since 1958 when the founder created one of the first, if not the first, commercially available hummingbird feeder. Since then, the company has gone on to create hundreds of different bird feeders and the brand is now owned by Woodstream. You may be familiar with the brand Perky Pet as they have a presence at most big box retailers. Unfortunately, you will mostly find the lower end feeders at these stores. Luckily, Perky Pet does have a much nicer line of feeders but they don’t often make it into stores. The Perky-Pet Super Carousel Wild Bird Feeder is one of those exceptions. It is a quality, large hanging feeder that competes with some of the very best bird feeders available today. With its large 8 lb seed capacity, squirrel shield, option to hang or pole mount, and 8 feeding ports it is certainly should be a contender on your short list of feeders. Perky-Pet Super Carousel K351 has been around for quite a while under various names. The design itself is a popular one and many people rave about these feeders. The top baffle and seed tube are made from UV coated acrylic. Generally we prefer polycarbonate, but there are many owners that say these acrylic parts have lasted more than a decade with minimal wear. Some owner say that their Super Carousel Feeder lasted 20 years before they replaced it with another. The feeder ports and perches are made from powder coated zinc cast metal and do a great job of resisting rust, breakage, and chewing. There are some components made of plastic but they are reserved for the internal components not exposed to the exterior. The quality over all is excellent on this feeder. The fact that owners have enjoyed the same feeder for 20 years is a testament to how this feeder is designed to stand the test of time. Extra large 16″ x 16″x 13″ size. With its sizable seed capacity of 8 lbs, the Perky-Pet Super Carousel Wild Bird Feeder should keep you from having to refill it often. Some owners say that the birds visit so often that seed gets depleted in a matter of days. Other owners say that it lasts weeks so it would be safe to assume that the type of birds and your geographic location may play a role in refills. 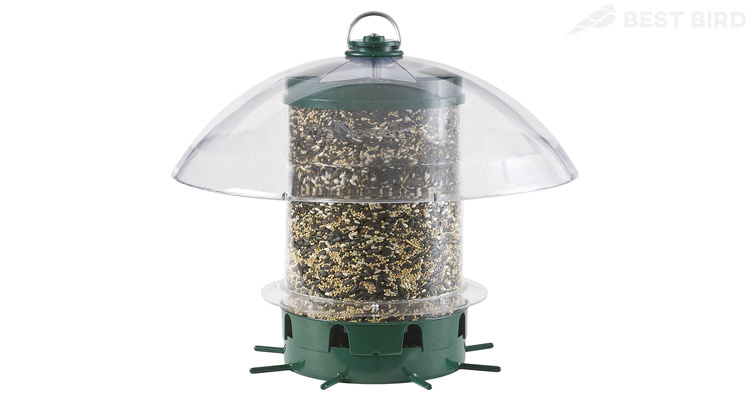 The feeder is easy to refill by simply unscrewing the top and pouring in seed. Cleaning the Perky-Pet Super Carousel Wild Bird Feeder is relatively simple. The only parts which need cleaning are the tube which houses the seed, and the bottom base. Many owners prefer to simply wash it out with a hose and scrub with a little mild soap and water as needed. Many owners report that it does such a good job of staying dry that they do not feel the need to clean it very often. Perky-Pet does not offer as generous of a warranty as Brome or Droll Yankees, but that doesn’t seem to affect how much owners seem to like this feeder. The 30 day guarantee that Perky Pet offers seems to handle most of the maintenance issues that have come up. Most concerns are about replacement parts many years down the road for which Perky Pet generally has available. The manufacturer has proven to be quick to respond and in many cases is proactive in helping resolve issues regarding performance or parts. The Perky-Pet Super Carousel Wild Bird Feeder is ready to install right out of the box which is great given its size. The Super Carousel is flexible in the way it can be installed. You can choose to hang it or you can pole mount it. It features a 1″ hole in the bottom for pole mounting if that is your desire. As with most bird feeders, getting the feeder away from squirrel jump off points is a must. Though this feeder has some squirrel resistant features with the baffle, it will not do much if the squirrel can reach the feeder from the side. At a retail price of $99.99, it is priced on the in the middle of the spectrum for quality bird feeders. In the case of the Perky-Pet Super Carousel, you will be getting a bird feeder that is likely to last many years as it lacks any moving parts. The parts it does have are made from high-quality components including a squirrel baffle to deter squirrels that try to access the feeder from the top. The feature set overall is well above average and the reported life of the feeder is astounding. Finding the best bird feeder that combines durability, capacity and simplicity can be a challenge. We think the Perky Pet Super Carousel delivers at this price point something that most bird feeder do not. 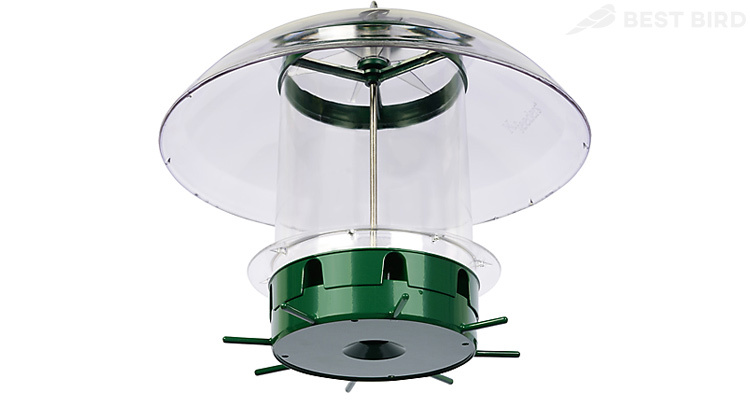 Though we would prefer to see a better warranty, the feeder does feature incredibly high-end components that are proven to last years (in some cases decades) and we believe that this feeder is one of the best values for a large capacity bird feeder. With a design that can last decades, large 8 lb capacity, and great customer service we think the Super Carousel from Perky Pet will provide you with many happy years of enjoyment. The only drawback is the short warranty and the lack of more effective squirrel proof features. Though the quality and complaints (or lack of) from owners seem to put both of these concerns to rest.